Karen Navarro of La Plata, Maryland, suffered from increasing pain in her right ankle for more than 20 years, which eventually kept her from her favorite outdoor activities such as softball, attending car shows and working in her yard. Exhausted from the pain, she went to see her primary care doctor, who referred her to Dr. Steven Neufeld of The Orthopaedic Foot & Ankle Center in Falls Church, Virginia. Dr. Neufeld recommended a total ankle replacement and replaced Karen’s right ankle on Oct. 14, 2015, with the INFINITY® Total Ankle System. The procedure has allowed Karen to get back to enjoying the outdoors and going to the gym regularly. She is also looking forward to an active retirement at the end of 2016. From Dr. Neufeld’s experience with Karen and other patients, he believes the surgery is life-changing and gives patients the opportunity to live without foot and ankle pain. Chris Dodder, a father who loves to stay active with his three kids and coaches their sports teams, suffered decades of ankle pain after playing soccer at the University of Tulsa. The university’s turf technology wasn’t advanced at the time and caused him to begin experiencing ankle pain. He suffered from ankle problems throughout college and had surgery at the end of his career, which doctors told him would provide relief for about 20 years. About 20 years later, Chris went to Disney World with his children and was in so much pain that he couldn’t keep up with them at the park and decided it was time to see a doctor about fixing his left ankle. Chris met with Dr. Stotler of Tulsa Bone & Joint Associates, and he received the INBONE® Total Ankle System in early 2015. After conducting 30-40 ankle replacements per year, Dr. Stotler was able to determine that Chris was the perfect candidate for the INBONE® Total Ankle. Since receiving the ankle replacement, Chris lives virtually pain-free after a short amount of recovery time. The opinions of Dr. Stotler and Chris Dodder are theirs alone and do not necessarily reflect the opinions of Wright Medical. Taking his three children to Disney World for the very first time should have been a dream come true for Tulsa-resident Chris Dodder. Unfortunately, the lasting effects of an injury he sustained to his left ankle while playing soccer in college threatened to ruin that dream. The constant, nagging ankle pain and numbness made it challenging for me to keep up with my seven, nine and eleven year old children during my recent vacation. After meeting with Dr. Westley Stotler of Tulsa Bone and Joint Chris learned he was an ideal candidate for a total ankle replacement. On March 11, 2015 Dr. Stotler implanted an INBONE® Total Ankle System in Chris’ left ankle. Since receiving his implant Chris has been able to get back to what he loves—being active and coaching his children’s many sports teams—pain free. Real estate agent Lynette Parsons has suffered from ankle pain and arthritis since age 14. After being in pain for decades, walking with a cane and dreading stormy weather that made her ankle hurt even more, she wanted to find a solution. Lynette began interviewing a span of doctors in as far as Europe to explore her options until she met Dr. Jason Piraino of UF Health in Jacksonville, Fla. and learned that ankle replacement was her best option. As a real estate agent, Lynette didn’t want her job to suffer, and with a total ankle replacement, her work didn’t skip a beat. Dr. Piraino explained that doctors take a CT or CAT scan, send the results to the manufacturer and the patient specific guides are created. He said the technology has greatly improved in the last 10 years. In fact, Lynette hardly missed work after the procedure and has been living pain-free ever since. The opinions of Dr. Jason Piraino and Lynette Parsons are theirs alone and do not necessarily reflect the opinions of Wright Medical. Scott Quillen joined his brother for a mini bike test drive in March 2010 and fell off the bike, resulting in a shattered fibula and a compound dislocation of his right ankle. Although the rest of Scott’s leg healed after the accident, his ankle began causing him severe pain shortly after the accident. Scott’s pain became unbearable to the point that his quality of life was at zero, and he discussed the option of amputation with a fellow veteran who underwent the procedure to determine if it would be the best option for him. A couple of years after the accident, Scott met another ankle pain sufferer at a tag sale, and she told Scott to meet Dr. Collin Ball in London to discuss a total ankle replacement, which she had just underwent. Scott immediately scheduled an appointment with Dr. Ball, and the doctor decided that Scott met the requirements for candidacy to receive a new total ankle replacement for his right foot. Dr. Ball explained that not everyone is a candidate for total ankle replacement, but three years later Scott is still living a full life and is able to enjoy the outdoor activities that he enjoys and missed those years that he suffered from the severe ankle pain. 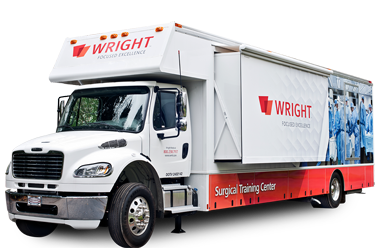 The opinions of Dr. Ball and Scott Quillen are theirs alone and do not necessarily reflect the opinions of Wright Medical. Janet Kinser broke her right leg and ankle more than 20 years ago in a roller skating accident, and although her leg healed, her right ankle deteriorated over the years to the point of severe constant pain from bone-on-bone rubbing. Eventually, Janet couldn’t enjoy the outdoor activities she enjoyed most because of the pain, and she decided to seek help. Dr. Corey Rosenbaum of Florida Hospital Flagler in Palm Coast performed the hospital’s first total ankle replacement on Janet’s right ankle last fall. After the procedure, Janet had no pain in her ankle and now walks and exercises outside free of pain. Dr. Rosenbaum explained that with better implant technology, he is now able to conduct the procedure more easily and that the main goal of the replacement is to reduce the patient’s pain, improve mobility and improve stability in the ankle joint. The opinions of Dr. Rosenbaum and Janet Kinser are theirs alone and do not necessarily reflect the opinions of Wright Medical. Ask a Doctor: When is ankle replacement right for you? Dr. Jesse Doty of UT Erlanger Foot and Ankle Institute answers a reader’s question about when to consider ankle replacement. Dr. Doty suggests that patients who have completed at least six months of therapy with bracing, anti-inflammatory medications and a cane or crutches, with little success, may be good candidates for an ankle replacement. He explains that if a patient is deemed a good candidate their physician will remove the worn-out joint surface and resurface with a metal alloy and a plastic spacer, replacing the damaged cartilage surfaces. The opinions of Dr. Doty are his alone and do not necessarily reflect the opinions of Wright Medical. At the age of 50, Massachusetts resident Ron Lagasse began experiencing shooting pain in his right ankle and chalked it up to typical aches and pains. Quickly, the pain worsened and his active lifestyle of Warparticipating in outdoor activities was reduced to debilitating pain from solely bringing the trash down his driveway. Shortly after, his left ankle began to bother him just like his right. Ron was desperate to find a solution. He tried braces, anti-inflammatory medication and cortisone shots, but nothing worked. Ron had been told by his first orthopedic doctor that ankle replacements were not an option, however, that all changed when he met Dr. Stephen Rogers of the Foot & Ankle Institute of New England. When Dr. Rogers first met Ron, he found that Ron’s ankles were completely deteriorated, rubbing bone on bone, and his bones had shifted so they were angular to each other rather than flat. After a complete examination, Dr. Rogers explained Ron’s treatment options and said that total ankle replacement was indeed an option for him. In March 2014, Ron had the INBONE® Total Ankle System placed in his right foot and then the left in February 2015. Now he is able to get back to normal life. The opinions of Dr. Rogers and Ron Lagasse are theirs alone and do not necessarily reflect the opinions of Wright Medical. Foot and ankle surgery specialist, Dr. Collin Ball, strives to bring the latest technology to his patients and community members living in the area of Laurel County, Kentucky. A groundbreaking procedure that he provides is the total ankle joint replacement, which is an alternative to joint fusion procedures. Dr. Ball explains that total ankle replacement is an option for those who suffer from rheumatoid arthritis or loss of joint motion, which causes a patient severe pain and bone-on-bone rubbing. In the past, patients suffering with this pain were faced with three options: pain medication, wearing a brace full-time or ankle fusion. With the introduction of ankle replacements, patients can significantly reduce their discomfort without sacrificing joint mobility. Somerset resident, Scott Quillen, is a patient of Dr. Ball’s whose ankle was injured after a motorcycle test drive, which resulted in a compound dislocation to his right ankle. Over the years, Quillen’s pain worsened, and he considered amputation before being referred to Dr. Ball for a consultation. Quillen now has full rotation back in his ankle. Christine Smith, 60, had badly sprained her ankle about 30 years ago, and over the years saw an increase in weakness and pain. She had gotten to the point where just taking a step hurt. Smith leads a very active lifestyle working with the Girl Scouts of Eastern Pennsylvania nature program and as part of the Pennsylvania Wilderness Search and Rescue team where her specialty is visual man tracking. This work requires the ability to get up and down from the ground with ease—something that had grown very painful for her over the years. When Smith first sought out an orthopaedic specialist she was told that ankle fusion was her only option. That was until she met Dr. Benjamin Overley with the Coventry Foot and Ankle Surgery practice, a specialty recently formed by Pottstown Memorial Medical Center. Dr. Overley explained a more attractive option that would allow her to maintain more mobility-total ankle replacement. In 2014 Dr. Overley implanted the INFINITY® Total Ankle System in Smith’s left ankle and she hasn’t looked back since. Smith recalls an easy recovery which culminated in her hiking the Appalachian Trail seven months after her procedure. Dr. Overley said ideal patients are those suffering from post-traumatic arthritis with a history of sprains or fractures. Once recovered, patients can typically ride a bike, swim, walk recreationally and play golf (with a brace). The opinions of Dr. Overly and Christine Smith are theirs alone and do not necessarily reflect the opinions of Wright Medical. Salem orthopedic surgeon Dr. Kelly McCormick has been performing ankle replacements for three years, and while people may not be familiar with the procedure, he says the procedure is fairly common. Dr. McCormick’s patient Mary Davis first damaged her ankle during a basketball game in high school nearly 50 years ago that resulted in several years of pain, torn ligaments and sprains. A surgery to repair the torn tendons and ligaments provided her some relief, but the pain reappeared around age 50. Mary tried to deal with the pain by taping the ankle to keep it secure, but over time the pain became too much and she went to see Dr. McCormick. Dr. McCormick gave her the option of an ankle fusion or total ankle replacement. To test out the options, he provided Mary with a boot that simulated the mobility of a fused ankle, and after an hour of wearing it, she decided that a total ankle replacement would be the best choice for her. Mary received the INBONE® Total Ankle System replacement from Dr. McCormick at Hope Orthopedics in October 2013, and after four weeks of recovery and six weeks of physical therapy, Mary was back on her feet, pain free. The opinions of Dr. McCormick and Mary Davis are theirs alone and do not necessarily reflect the opinions of Wright Medical. Scott Quillen, a 55-year-old retired Air Force Master Sergeant, was ready to have his right leg amputated from the knee down due to excruciating ankle pain that had been developing from a motorcycle accident several years ago. Since the accident, he had undergone surgical treatment, cortisone shots and taken pain medication, but nothing seemed to help. Dr. Collin Ball, a podiatric surgeon with KentuckyOne Health Orthopedic Associates, felt Quillen qualified as a good candidate for the INBONE® Total Ankle System procedure. Dr. Ball explains how the procedure and INBONE® Total Ankle System work, and finds it to be one of the top-of-the-line replacements. He explains how the device is being refined and upgraded, patient recovery time is a lot quicker, it preserves range of motion, and it allows a patient to continue to do most of their daily activities. Since the surgery, Quillen sees receiving the INBONE® Total Ankle System as a blessing. Pre-surgery he dreaded getting out of bed, and now he is back to doing everything he loved to do, including walking 5k’s on the treadmill three times a week. Dr. Simon Lee from Rush University Medical Center and Midwest Orthopedics in Chicago, Ill., discusses the evolution of total ankle replacements, and their recent increase in popularity as the technology and design has advanced, due in part to the evolution and from lessons learned from other joint replacement procedures like the knee and hip. He explains how ankle arthritis, mostly as a result of an injury, is extremely painful and one of the main reasons for patients to look to ankle replacement as a form of pain relief while retaining foot mobility. The previous standard of care included ankle fusion which greatly limits a patient’s mobility and can result in pain or arthritis developing in other parts of the body, such as the back. Dr. Lee’s patient, Robert Corwin, was experiencing increasing ankle pain and was at the point that it was almost impossible to walk. Mr. Corwin explains that as an active judo instructor in Yorkville, Ill, having the ankle replacement surgery was the best option for him as it eliminated the pain, but also allowed him to keep his mobility and flexibility. As patients go into recovery after the procedure, Dr. Lee outlines the time frame of being able to move the ankle within the first 6-8 week in physical therapy, and are about 3-4 months away from fully weight bearing and being able to do their routine actives. The opinions of Dr. Lee are his alone and do not necessarily reflect the opinions of Wright Medical. Mary Davis injured her ankle while playing basketball in high school and it was never the same. It wasn’t treated properly, and years later, Mary’s ankle deteriorated to the point where she couldn’t participate in activities with her grandchildren due to the pain. Dr. Kelly McCormick of Hope Orthopedics in Salem, Ore., recommended the INBONE® Total Ankle System, and now Mary can play basketball with her grandchildren and get back on the tennis courts that she loves with no pain. Dr. McCormick explains that ankle replacements have improved based on key learnings from knee and hip replacements over the years, and although it is a very complex procedure, it has enabled Mary to live a life without pain. Aspiring skiing Olympian, Cathy Smithers, sustained multiple fractures to the tibia and fibula of her right leg before the age of 19 and forcing her to cease participating in the sport altogether or risk injury and never being able to walk again. Cathy tried to keep a positive attitude after having to stop skiing and began working with special needs children—but she continued to experience pain in her ankle that progressively got worse as she got older. Smithers consulted with multiple doctors until she scheduled an appointment with Dr. Steven Haddad of IBJI in Glenview, Ill. Dr. Haddad rebuilt her foot and performed a total ankle replacement. Smithers is now able to return to the slopes 50 years later and ski with her grandchildren. The opinions of Dr. Haddad and Cathy Smithers are theirs alone and do not necessarily reflect the opinions of Wright Medical.